Education for Life in Public School : Second Week and Having Fun! Second Week and Having Fun! I am officially enamored with all my students now, with all of them in their full spectrum, from heavy....to light. Even the heavy students have so much potential that shines out from time to time. The students kept writing 3 things that made them smile or gave them joy daily as I try to help them develop the habit of looking for the joy even in little things. 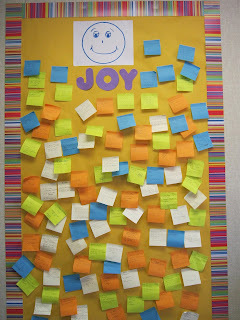 Here is the JOY bulletin board where they put the sticky notes on their way out of class. It makes me smile every time I glance over and see it. I was happy to share one of my favorite quotes with the students as we continue to talk about qualities of one’s personal excellence. “The true nature of anything is the highest it can become.” This has been attributed to Aristotle but I have never found the source of the quote, maybe it was when he wrote about ‘potentiality’. We had a great class discussion on what attaining one’s highest means. They are also looking forward to studying more about Aristotle and the ancient Greeks later on in the year in Social Studies. We continue to work on our Personal Excellence bulletin board. It is almost done! As I attempt to get the students out of their seats more often the funniest ‘movement break’ happened when we were looking at ‘specialized vocabulary’ in our history book. It mentioned that history had special vocabulary like ‘archaeology, era, BC, or BCE,’ etc. just like in ballet you use words like ‘plié, barre’ and in football you use words like ‘sack, quarterback’. My students know the football words but only the dancers (girls) knew the ballet vocabulary. I asked my two ballet dancers in the class to lead us all in a plié exercise. It was great fun to see the football players and others try these exercises. They had a great time trying to do it, although sometimes they were laughing too much to do a very good job. The expert dancers loved being the teachers and yes even I was trying it! One of the big challenges this year will be to get the students experiencing more. Already they have had their first standardized pre-test in language arts to gauge the level of their academic knowledge. Perhaps during Social Studies I will have more time and freedom. I will keep trying to find ways and I will report and share any successes.